The Melbourne crew have done it again and gone and launched a brand new magazine way ahead of the rest of us. While Sydneysiders are still arguing over whether Clover Moore’s bike lane through 2010 will serve anyone other than the ‘sandal wearing muesli crunching’ [as Paul Keating so eloquently put it], the Melbourne peeps have just bypassed such ridiculous time wasting and moved straight in for the kill. 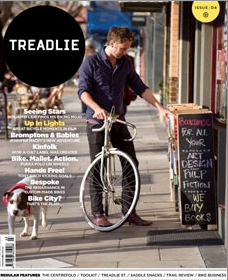 Enter Treadlie. A brand new magazine by the guys at Green that promotes, encourages, explores and connects those involved in bike culture. And by the looks of it, this movement extends way beyond hippies in hessian or sociopaths in spandex. How refreshing.